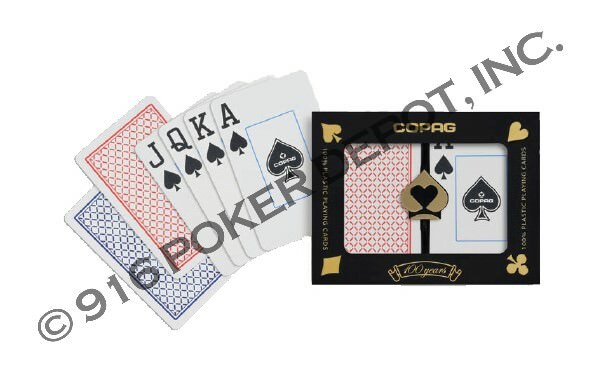 The Copag Casino Pro and Poker Pro Playing Cards are only available to license gaming establishments and a proof or registration is required for security purposes. 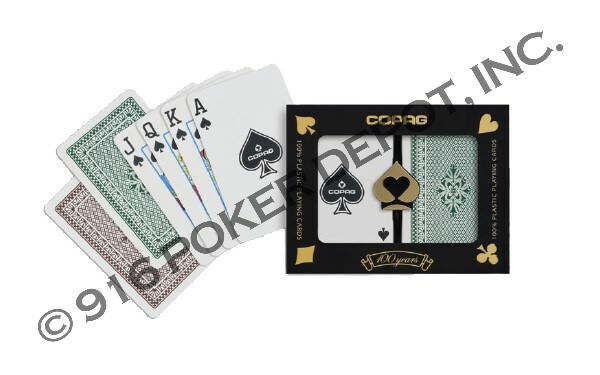 Available in 100% plastic or paper, these playing cards offer high security and are supplied to major casinos throughout the U.S.A. and around the world. Choose from Bridge or Poker size with regular or jumbo index. 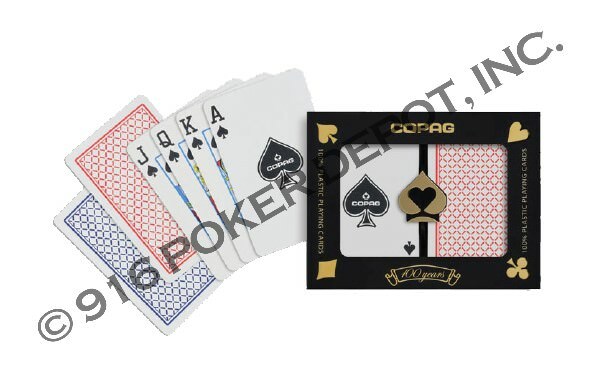 Copag Casino Pro and Poker Pro Playing Cards are manufactured with high quality materials. The advanced technological applications and process control guarantee the highest table performance. The extensive statistical inspection procedures throughout production ensure higher and more consistent quality control. Custom design is also available please contact us today for more information. Green & Brown. Bridge size 2 1/4” x 3 1/2” regular index 100% plastic playing cards. Used by poker rooms around the world these cards are extremely player and dealer friendly. This product is only available to licensed casinos. Sold by the case 12 setups / 24 decks decks per case. Red & Blue. Poker size 2 1/2” x 3 7/16”. These cards are available in both plastic and paper. These cards are ideal for casinos that need secure cards, but don’t need to order thousands of decks at a time. This product is only available to licensed casinos. Sold by the case 144 decks per case. Red & Blue. 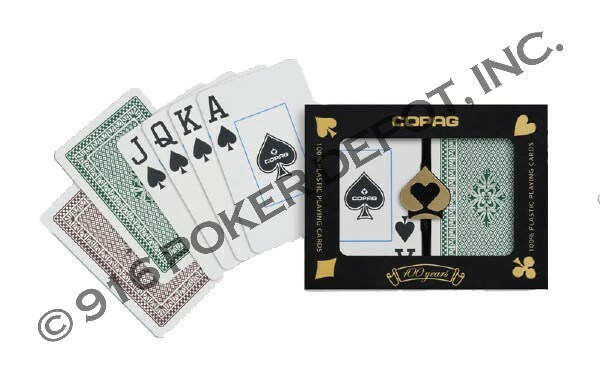 Bridge size 2 1/4” x 3 1/2” jumbo index 100% plastic playing cards. Used by poker rooms around the world these cards are extremely player and dealer friendly. This product is only available to licensed casinos. Sold by the case 12 setups / 24 decks decks per case. Red & Blue. 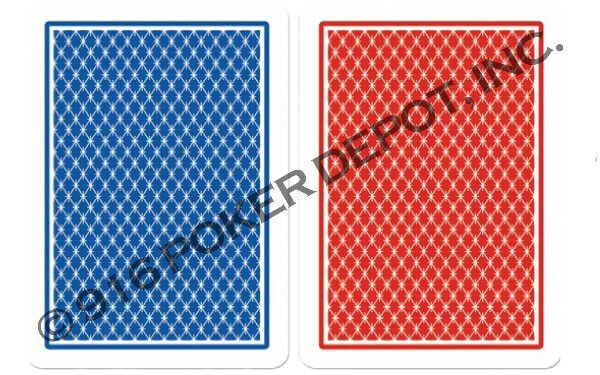 Bridge size 2 1/4” x 3 1/2” regular index 100% plastic playing cards. Used by poker rooms around the world these cards are extremely player and dealer friendly. This product is only available to licensed casinos. Sold by the case 12 setups / 24 decks decks per case. Green & Brown, Bridge size 2 1/4” x 3 1/2” jumbo index 100% plastic playing cards. Used by poker rooms around the world these cards are extremely player and dealer friendly. This product is only available to licensed casinos. Sold by the case 12 setups / 24 decks decks per case.